The UFC's second PPV effort of the year is here and boy, is it....a card full of people that fight. Your faithful three of Paul Fontaine, Ryan Frederick, and I will pose a few questions about UFC 221 and whether it's worth your effort and money to watch. The latest twist to this blaise card is that Yoel Romero missed weight by nearly three pounds so if he wins, he doesn't get the interim middleweight title. If Luke Rockhold wins, it may just be a done-in-one situation because he wants to move up in weight. BUY THIS SHOW NOW. What fight(s) are you most looking forward to? Ryan: I’m most looking forward to the main event. Say what you want about this being an interim title fight, but it is an excellent matchup. This was going to likely be next if Rockhold had beaten originally scheduled opponent Robert Whittaker and Romero beaten originally scheduled opponent David Branch in Orlando. That some pundits are saying this is the worst interim title fight to date is really a slap in the face to both guys as there have been worse interim title fights. I expect this to deliver. I’m also looking forward to seeing Mark Hunt fight because it’s Mark Hunt and he’s always fun, and the UFC debut of Israel Adesanya. He has future star potential and is a violent and exciting fighter. Paul: Gotta say the main event as well. I’ve been as down on this as a title fight as much as anyone but taking that aspect away from it, it’s a helluva fight. Combined, they are 14-2 in their last 16 fights and all against top notch competition. The winner here is a worthy #1 contender to Whittaker once he returns, but I’m just not sure they’re a worthy champion. But, it should be a great fight. Nason: I mean, that Jumeau vs. Abe fight is going to be LIT. (Just kidding. I'm too old to be using lit.) It's the Rockhold-Romero fight. This is a one-fight show with a few slightly interesting storylines, but that's about it. I still am impressed they brought back an interim title they just put back in the closet this soon. I was interested to hear both guys wanted this fight on free TV a few times, but now we get to pay $65 for it. Hooray. Ryan: I really like the prelim headliner between Damien Brown and Maestro Dong Hyun Kim. They are exciting lightweights, and both have been involved in some of the best fights in the UFC in recent years. They both like to stand and trade, and they have the chance to steal the show. I also like the featherweight bout between Alex Volkanovski and Jeremy Kennedy. They are both undefeated, and while not known much and not known for the most exciting fights, they are definite prospects in a crowded division with a chance to breakout here. Paul: The flyweight fight on the FS1 prelims between Ben Nguyen and Jussier Formiga should be great. Nguyen, in particular, is an exciting fighter with finishing ability, which is rare for the flyweight division. These are easily the two best contenders to never receive a title shot at Demetrious Johnson and an impressive showing from either guy should put them at the top of the list in my book. Nason: I'll go with Tai Tuvasa vs. Cyril Asker. Tuvasa is six-for-six with knockouts in a career that started nearly six years ago. He hasn't fought a lot, but at 24 years of age, a young heavyweight is badly needed in the UFC. And, if we're being honest here, I've never heard of Cyril Asker before in my life. What isn’t doing it for you this weekend? Paul: I get they want to push local guys in the market, but UFC usually saves that stuff for FS1 shows. Tyson Pedro and Saparbek Safarov is not a PPV caliber fight, nor should Tai Tuivasa and Cyril Asker be third from the top...or even on the PPV card, really. But looking down the card, it’s hard to even find a fight you’d replace them with. This show has no depth and at some point in the last six weeks, I feel UFC should have made the decision to move this card to free television. A move like that is not without precedence. UFC simply doesn’t have enough star power at present to justify monthly PPVs without having cards like this come up more regularly. The next few months are not looking much better either. Ryan: The main card isn’t doing much for me outside of the main event. It is definitely an event made for the market they are in, but it isn’t a pay-per-view caliber event. That’s what happens when you have 24 events in 26 weeks. It’s overkill, and you get left with events like this that suffer. I think there are several prelim fights that are stronger than a couple of main card fights. Nason: That people are being asked to pay $65 for this is...interesting. This will be a good check of the base as I think this will be the floor for PPV sales. 100,000 buys...maybe? Nason: I'll answer first. It doesn't. Rockhold said a move to light heavyweight is "imminent", so even with a win, we may never see him fight Whittaker. If Romero was to win, we'll get a rematch of he and Whittaker but that fight wasn't that great to begin with. The rest of the card is shuffling cards. I like Mark Hunt, but he's gone from the promotion after he finishes his last few contracted fights. Ryan: I guess in the long run, you can say yes because it gets a clear next challenger at 185 pounds. It also gives you a good sense of how the UFC fares in a new market. 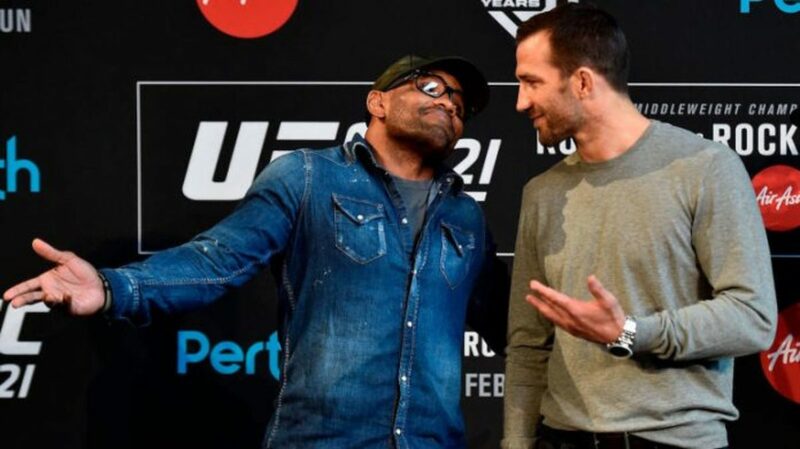 However, outside of Rockhold vs. Romero, it’s not a show that has any immediate bearings on divisions, so it’s a true “meh” type of pay-per-view offering. Paul: It matters for two reasons. The Romero-Rockhold winner is the clear #1 contender and depending on the recovery time for Whittaker, they could end up even defending that interim title down the road. The other reason is to see just what the UFC’s low-end base for PPV is in 2018. I feel like it's up a bit since the really down days of 2014 but we'll likely find out soon enough as this show may be the weakest overall lineup that UFC has presented for a PPV card since UFC 177. Keep up with our coverage on Saturday night, starting with the Fight Pass prelims through FS1 through the PPV.